Last week I had a killer menu planned and everything was deeeeeeeeelicious! 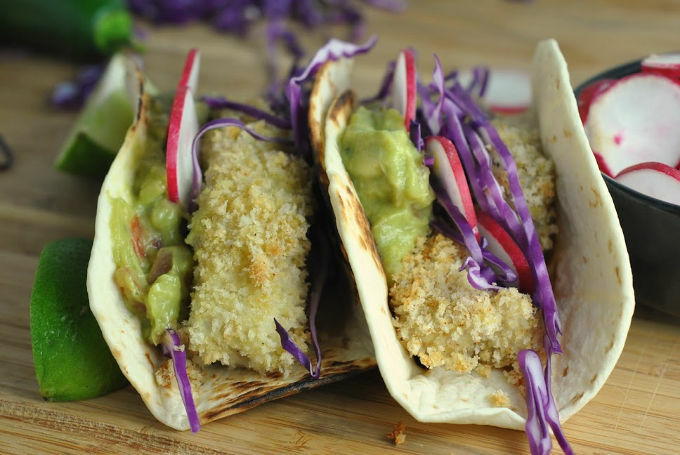 Last Sunday before hockey, I was whipping up these Crispy Beach Fish Tacos. I wasn’t so sure the kids would go for them, but luckily they did. I had doubled the recipe hoping that would be the case. And it often is when a meal involves fish – especially white fish. But before all that, I was prepping away. I had saved a bit of money and bought a head of red cabbage instead of the pre-shredded offering and so I whipped out my mandoline, ready to go! I thinly sliced those stunning radishes and moved on to the cabbage. I was nearly done with the whole head of cabbage when off came half my pinky finger pad. Okay, that’s a bit of an exaggeration, but it was a little gruesome there for a bit. I called Shea over to show her what a “real boo boo” looks like and she looked on with worried eyes. She had some questions: does it hurt? Would I like a Peppa Pig bandaid? Yes and yes, my love. Hockey wasn’t pain-free, but I went for it. And after last night, I won’t complain about my mandoline injury. A guy on my team took a puck to the chin last night that resulted in a front tooth dangling in his mouth and a mouth full of blood. SO PAINFUL. I can’t even imagine. Very thankful for my FULLY caged helmet to protect my face. While he was a sport about a few guys calling him “Chicklets”, I would not be so humored. No, in fact, I’d have left and called an emergency dentist…not continued playing! At least he went on to score a goal! So with my caged helmet, it may be next up to invest in a kitchen safety glove for future mandoline use. 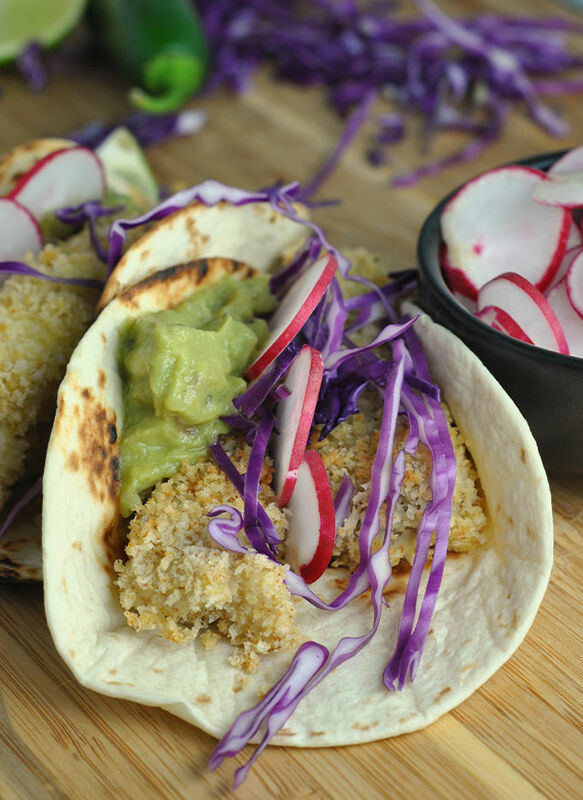 ‘Cause…these tacos will be on repeat, no doubt! 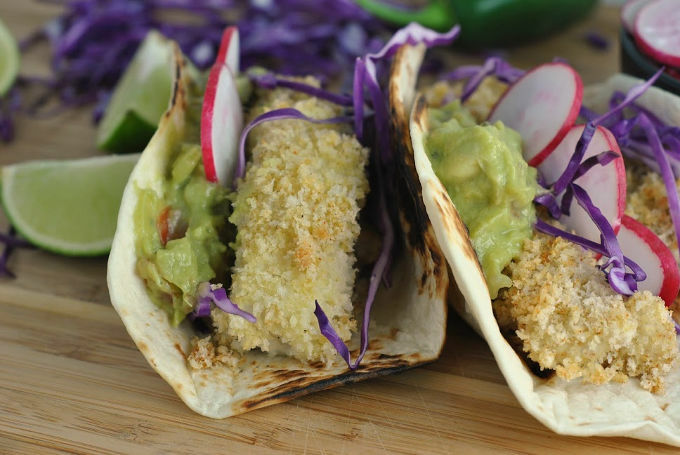 In a shallow bowl, combine the panko, cumin, garlic powder, and cayenne; mix until well-combined. Season cod strips with salt and pepper. Working one at a time, dip into the egg, coating completely and allowing excess to drip off. Next, roll in the panko, coating all sides; place onto the prepared baking sheet. Mist the prepared fish with olive oil cooking spray. Bake fish for 10-12 minutes or until cooked through and golden. 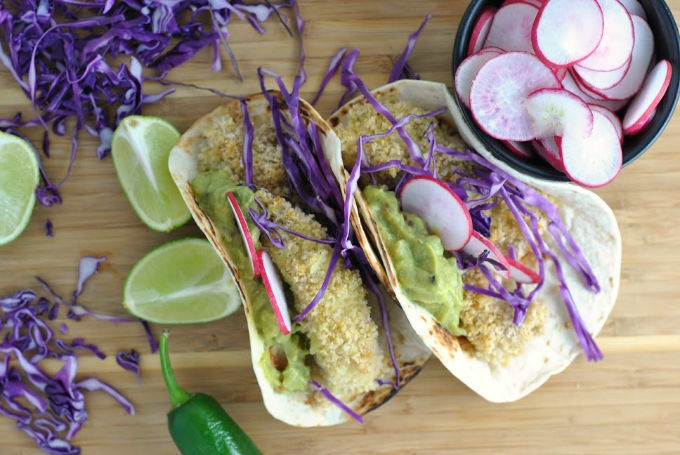 To assemble the tacos, place 2 ounces of fish into each tortilla and top with ⅛ cup cabbage, several radish slices, and 1½ tablespoons guacamole.